At first glance, The Art of In-Between (May 4 – September 4, 2017) exhibition, curated by Andrew Bolton, celebrates Comme des Garçons’ designer Rei Kawakubo for challenging western ideas of beauty. Yet, at second glance, a number of problems arise from the way in which the show relies on colonial references. Address contributor Emily McGuire visited the exhibition in New York. Hurrying through the bewildered crowds at The Metropolitan Museum of Art in New York, excited to see The Art of In-Between, I was overcome by an urge to slow down. Anyone familiar with Rei Kawakubo’s work will know that it’s utterly bewitching to experience up close. After wandering around for a while transfixed on the clothes, I began to see what’s normally so commonplace that one barely notices it. All the mannequins were white and their hairstyles were subtly loaded with colonial references ­– historic symbols that represent traditional European culture. I thought, ‘not again’. For me, as someone who is a longtime fan of Kawakubo’s creative practice, The Art of In-Between had me wondering: Is it necessary for clothing that challenges western conventions of beauty to be presented on white mannequins that evoke colonial references in order to aid this critique? 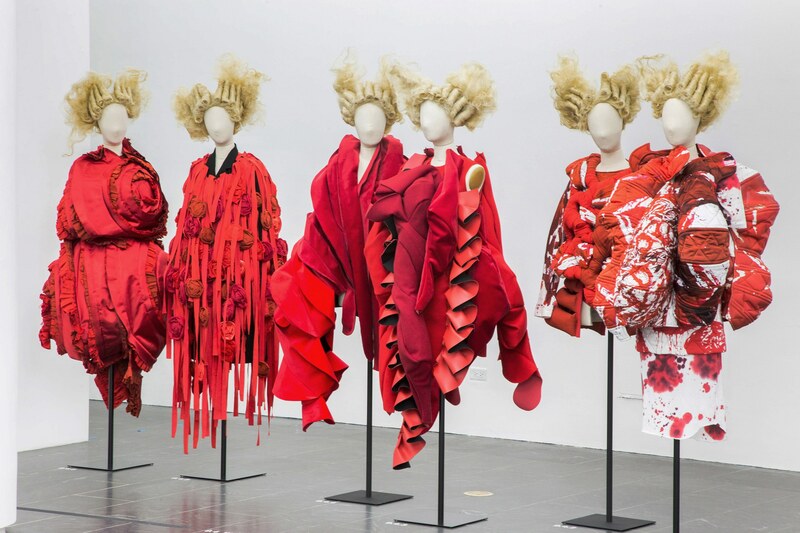 Known to industry insiders as an elusive agitator operating at the fringe of fashion, Kawakubo’s visionary designs spill into the public spotlight through The Art of In-Between. The show’s chief curator, Andrew Bolton, hopes viewers will meditate on the spatial relationship between body and garment, or ma as it’s known in Japanese culture. Her work responds to her transatlantic identity as a Japanese woman who grew up experiencing the aftermath of the Hiroshima bomb, later establishing her brand in Paris – the epicenter of European taste. 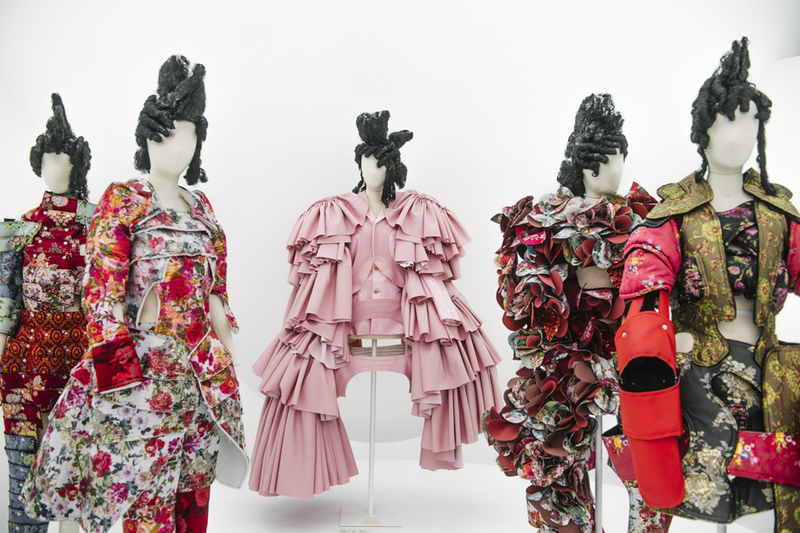 Through Comme des Garçons, Kawakubo’s designs are celebrated for subverting rigid binaries between genders, social relations, and high and low culture. Zen principles inform her approach to these dichotomies to propose alternative, often confronting possibilities for what else the fashioned body might be. Playing up her fascination with mu – the idea of nothingness – the exhibition challenges viewers to empty their minds of historical references and prejudices to question the boundaries between good and bad taste, absence and presence, fashion and anti-fashion. This wasn’t exactly the ‘voyage of discovery’ that the exhibition catalogue promised me. The 140 garments featured are presented on pale white mannequins, dotted throughout a curved maze of airy, light-filled compartments. The mannequin’s wigs often express colonial-looking hairstyles, teased and deconstructed into awkward shapes. The most obvious is a series of blonde wigs with disheveled curls mimicking feminine, aristocratic European coiffures of the eighteenth century. Maybe Bolton and Julien d’Ys, who created the wigs for the show (and Kawakubo’s runway presentations), thought styling them to evoke European tropes aligned with Kawakubo’s deconstructionist approach to western fashion culture. Perhaps the use of white mannequins was a deliberate decision – they blend almost invisibly into the surrounding white walls so viewers are focused on the clothes. However, I have to wonder whether using mannequins that represent diverse ethnic identities, or at least mannequins not suggesting colonial references, would actually detract from this aim. Jason Campbell doesn’t think so: ‘It’s a myth that uniformed skin colour is the way to convey a cohesive, singular design idea and it is irresponsible and senseless business-wise to ignore this hot-button issue.’ The problematic ‘casting’ for The Art of In-Between is exacerbated by the fact Kawakubo’s brand Comme des Garçons hasn’t shown a black model on the runway for at least 10 years, according to a recent analysis of Vogue Runway’s archives. 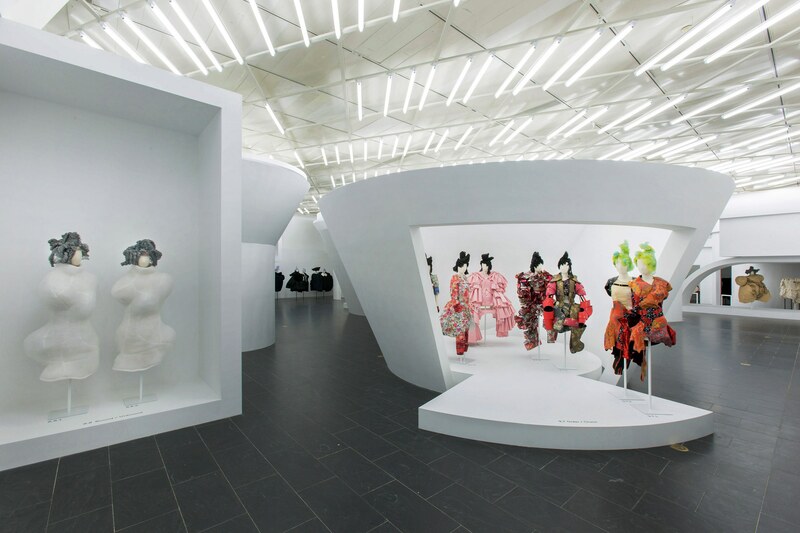 It also can’t be ignored that when fashion is presented inside ‘the white cube’ (and that’s what the space is, abstract exhibition design aside), it’s always immediately contextualised by the systems operating in the contemporary art world. Gentrification, capitalism and colonialism underpin its framework, and are perpetuated via its institutions and their permanent collections. As Brian O’Doherty writes, the white cube is problematic because it bleaches out the past and ‘censors out the world of social variation’, enabling colonial power structures to dominate mainstream accounts of art history. The Met’s 2015 exhibition titled, China: Through the Looking Glass received similar criticism for overlooking Europe’s appropriation of Oriental cultures. Bolton’s curatorial vision seems to embrace these same affordances for The Art of In-Between, using the white cube as a blank slate to stage Kawakubo’s provocative, time-bending works in a world reimagined in-between states of being. Ironically, in attempting to expose the ‘“emptiness” of conventional dichotomies’ the exhibition overlooks the racial binaries that pervade the fashion industry, effectively reinforcing them. The show has not questioned whether colonial bodies are relevant, or worse, necessary to validate critique of European culture in order to make the outcome appear beautiful. Having these realisations about The Art of In-Between was like being let down by someone you trust. After all, many of us consider the future of fashion safe in the talented hands of designers like Kawakubo. For those who adore her sensibility for the materiality of fashion, it’s frustrating that her brand underwrites its ‘visionary’ identity by overlooking opportunities to push fashion forward. Although it’s difficult to challenge those you admire, Kawakubo’s designs encourage us to question everything – and that includes her work in itself.